1780 Raynal and Bonne Map of Guinea. WE SELL ONLY ORIGINAL ANTIQUE MAPS - NOT REPRODUCTIONS JOIN OUR WEEKLY MAILING LIST FOR NEWEST STOCK. Title: Carte De La Haute Et De La Basse Guinee Description: A fine example of Rigobert Bonne and G. Raynal's 1780 map of Africa's Guinea coast. Map corresponds to modern day Liberia, Ivory Coast, Ghana, Nigeria, Cameroon, Gabon, Congo, and Equatorial Guinea. Features towns, rivers, some topographical features, ocean currents and political boundaries. Size: Printed area measures 9 inches high by 13 inches wide. If your address is a P. DHL International EXPRESS (45 USD). We can use your Federal Express Account. Duty varies by country and we cannot predict the amount you will be charged. Some countries are duty free, others are not. Additional Services Conservation Framing Services: Geographicus recommends basic conservation framing services for any antique paper. We do not offer this service. Antique Map Restoration Services: Geographicus can repair and restore your antique map. Services include deacidification cleaning flattening and backing. 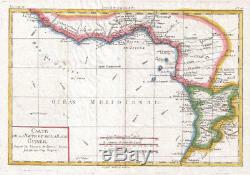 The item "1780 Raynal and Bonne Map of Guinea" is in sale since Thursday, July 19, 2018. This item is in the category "Antiques\Maps, Atlases & Globes\Africa Maps". The seller is "geographicusmaps" and is located in 11221.